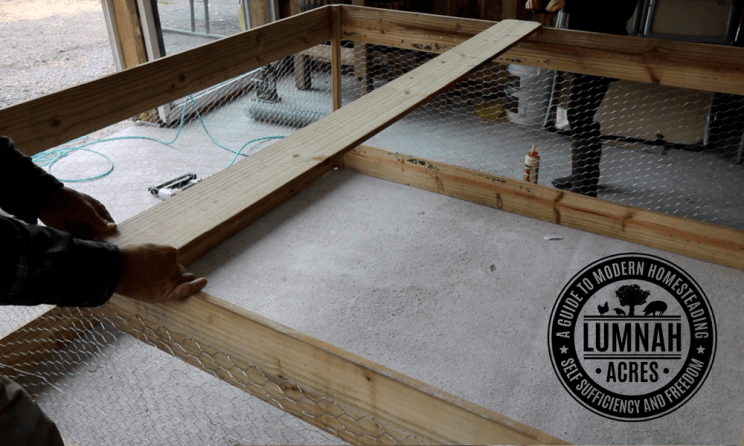 DIY Chicken Coop that you can build for $30 in 30 minutes! It sounds too good to be true right! But wait it gets even better. We are going to Build the coop from materials that you can buy right from your local hardware store. 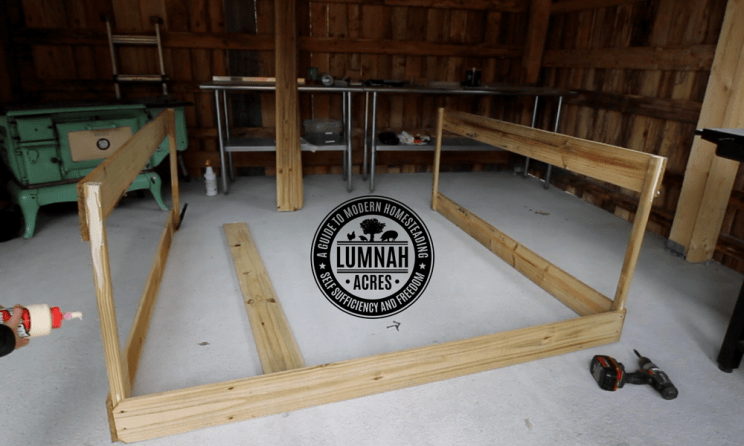 We aren’t building the coop from scraps we have lying around Lumnah Acres. 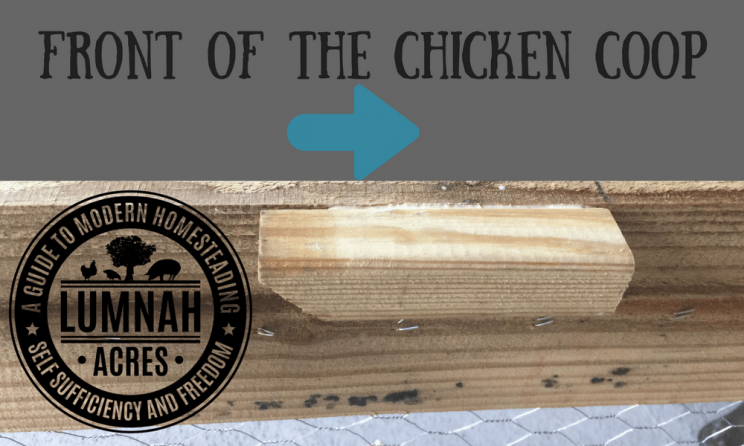 You can build this coop by following these directions for the same price as we did! If you don’t believe me here is the video we made of building the coop. You’re still thinking this is too good to be true. But it’s not! I think this could be a huge game changer for the whole backyard poultry movement. Now anyone who wants to try raising chickens can do so! 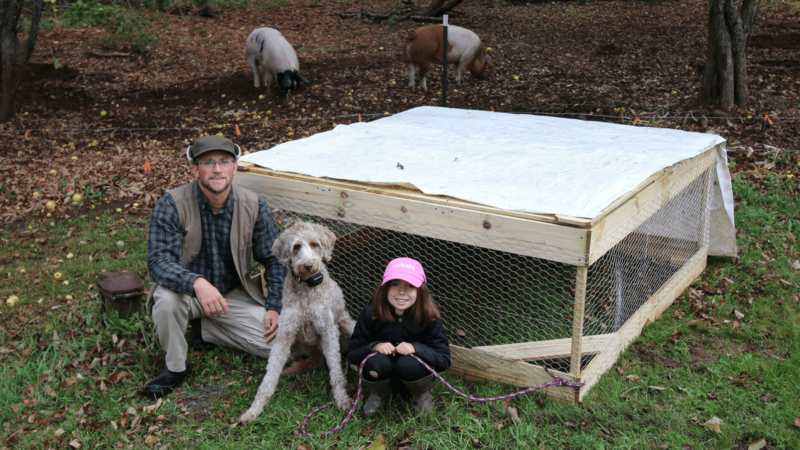 Without breaking the piggy bank and all you need is a half hour to build the coop. Screenshots of the prices of material when we built the chicken coop. 1~ 50 foot long by 2-foot wide roll of chicken wire netting you can you Hardware Cloth if you have a predator problem. 3~ Handmade 2”x2” hinges made from laundry detergent bottle or alike bottle. Cut the four deck spindles 30 3/8” long. If using a miter box cut all 4 boards at the same time. You will need to use tricks like this if you want a shot at getting it done in less than 30 minutes. After considering the saw blade cut this will leave you with 4 scraps that are 5 ½” long. Keep these as they will be used in later steps. Attach 2 fence pickets to 2 deck spindles as shown in photo by using eight 1.5 inch screws to make one side. Repeat this step for the opposite side as well. 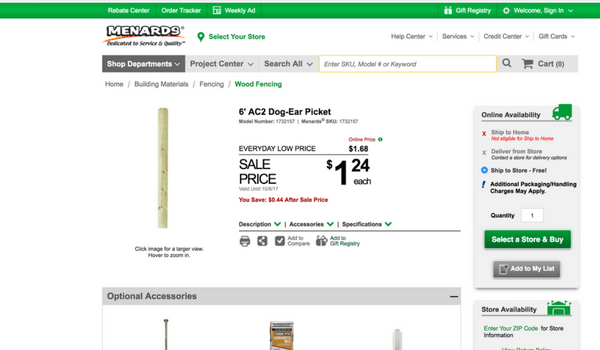 Please note: that fence pickets vary in size from 71 ¾” to 72”. This will not matter just keep the spindles spaced 72” apart. If the picket is short it will just not be flush against the spindle on one side. Attach 2 fence pickets to the left and right sides using eight 1.5” screws to make the front side. Please note: The fence picket gets flushed to the spindle and not the side picket. Meaning the front will be 73.25 inches wide overall when you consider the pickets on each side. In other words, connect the pickets just like you did in step 1 so the spindles are 72” apart. Repeat this step for the rear side as shown in step 2 photo. 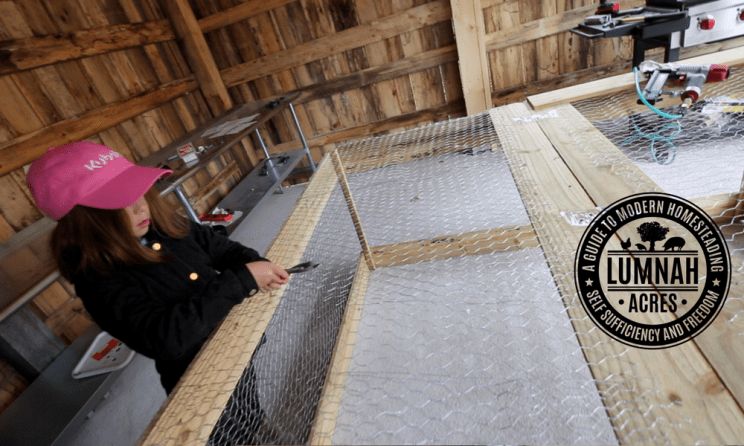 Unroll enough chicken wire to wrap all the way around all 4 sides of the chicken coop. 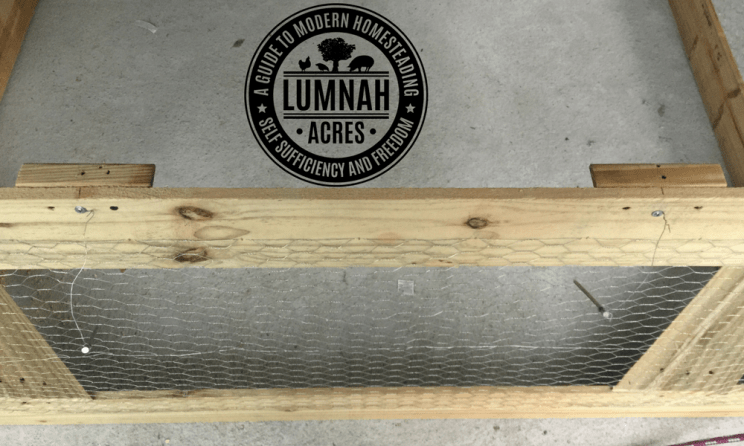 Start by stapling chicken wire to one of the 4 deck spindles and space the wire evenly measuring approximately 3 inches down from the top of the spindle. Work your way around the coop by stapling the wire to the top pickets. After you staple the chicken wire to the top pickets all the way around the coop, overlap some wire past the first picket you stapled to. Then repeat this step to the bottom pickets round all 4 sides of the coop. Cut roll after you finish stapling top and bottom on all 4 sides making sure you leave some extra to overlap the original spindle side you started from. This will make for a strong wire corner and will help it from coming loose in the future. After you finish this step add staples to each of the 4 spindles so your chicken wire also holds tight to the 4 spindle corner locations. Now we will add 2 of the 5 ½” deck spindle scraps to the left and right sides of the coop. These will be for our center support picket. Measure 36” from the edge of the rear spindle to the middle of the fence picket and mark a line at 36”. The line will be exactly in the middle of the fence picket if your fence picket is a true 72” long. Mark this line on both the left side and the right side on the top (5/8” side) of the pickets. Then take one of the 5 ½” spindle pieces and flush the end to the line you marked and to the top of the picket. The 5 ½” board should be flush to the line with the board going towards the rear side. In other words, the back side of the board should be at 30 ½” on the pickets. 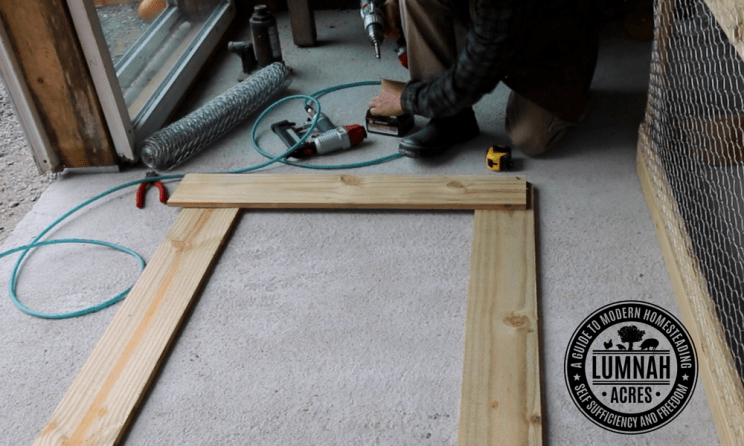 Install the 5 ½” board with two 1.5 inch screws per side. Install Fence picket center support to the top of the two 5 ½” boards you just installed in step 3 by using two 1.5” screws per side. Then start staging the door panel on the floor by spacing 2 fence pickets 36 5/8” apart. Cut the last fence picket in half so that each piece is approximately 35 15/16” long after considering the saw cut. Your pieces may be shorter if the picket was not 72” to begin with. This is fine as it will not be flush on the rear side of the door so the door can open most of the way. Place one of the 35 15/16” boards on the top front left corner of the front 72” picket board. Flush it to the front and the side of the picket making a square corner. Each corner gets four 1 ¼” screws in a square pattern. If you install just the front 2 screws and do not tighten them you can install the chicken wire sandwiched in between the 2 boards as seen in the Photo for step 5. This way you will have a very clean chicken wire look to the door. Repeat this step for the front right corner. Now, remember to place the 2 fence pickets 36 5/8” apart? The picket you cut in half the pieces is only 35 15/16” long. So flush the half pieces to the sides of the rear picket and leave them approximately 11/16” from the rear edge. This will make it so your door hinges open most of the way. If you made it flush your door will only open halfway as the half boards will act as a stop. Now measure 8 inches in on the center support picket on both sides and 36″ to mark your location for the 3 hinges. Install the hinges using four 9/16” wafer head screws per hinge as shown in the photo. You can choose to install the hinges after you install the chicken wire on the door panel if you so choose. Note: I would recommend installing the chicken wire first and then the door. Cut 3 pieces of chicken wire 32” long for the door panel. When you are done you will have 3 sections 24” wide by 32” long. Attach the 3 pieces together making one piece 32” long by 72” wide. Attach them together by cutting small pieces of the wire left over from the roll and tying them together. You can use zip ties for this step if your chicken wire did not come with a roll support wire. Install wire section to the door panel using ½” long staples. You can sandwich wire in between boards if you followed my instructions from step 4. Install the rest of screws to the 4 corners of the door panel and tighten. Now cut three 36” sections of chicken wire and attach them together like you did for the door panel. 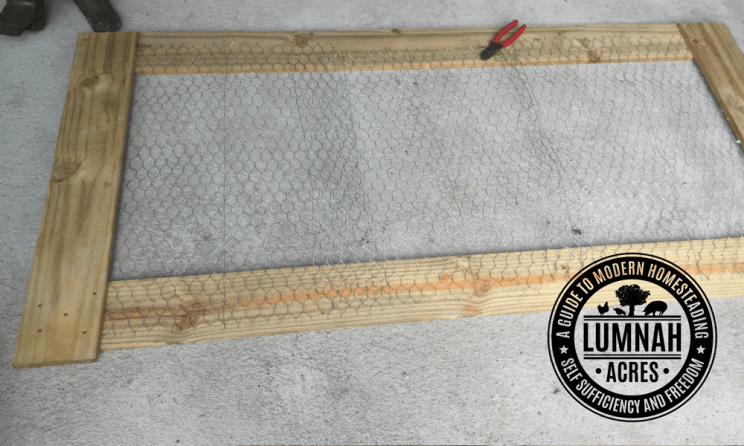 Install this chicken wire section to the roof of the coop from the center support to the back side of the rear panel using ½” staples. Make sure to overlap wire to the back side of the rear panel picket for a nice hold and staple all four sides of the chicken wire accordingly. You now open the door and mark 2 lines on the front panel at 2 foot and 4 foot on the top 5/8” side of the picket. 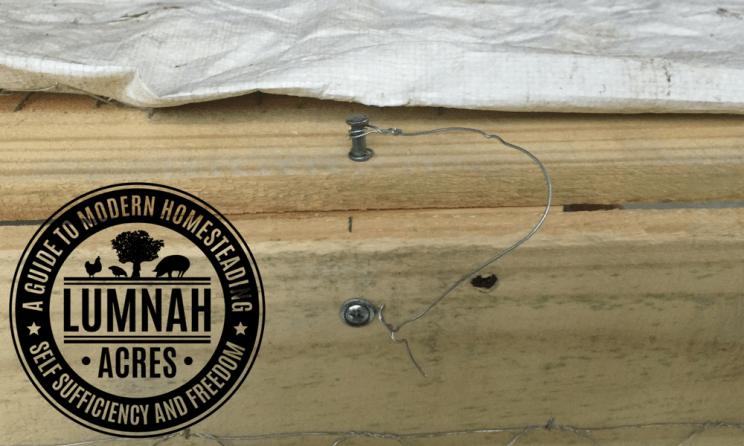 Take the last 2 remaining 5 ½” spindle boards and attach them to the picket on center with your 2-foot and 4-foot marks flush to the top of the picket using two 1.5” screws per board. When you are done installing them you should have 2 ¾” on each side of your mark. Now close the door and grab two 9/16” wafer head screws, some spare wire, your drill bit, your drill and your 2 duplex nails. Now mark 2 lines one at 2 feet and one at 4 feet on the top of the door 1 ¼” in from the edge. You will drill one hole through the roof panel and through the center of the 5 ½” board for you Duplex nail to go through and act like a pin lock to hold your door shut. Drill this hole and install the nails at both the 2-foot mark and the 4-foot mark. Now take some spare wire and wrap and tie it tight around the nail in between the 2 nail heads. The double-headed Duplex nail will act as a stop for your wire. Leave a good 8 inches of wire hanging off of each nail after tightening. Then take the other end of the wires and twist it around your 9/16” wafer head screws. Then install the screw and leave slop so you have enough slop to remove the nail. After you are finished you will have door pins and the wire will keep the pin in place when you open the coop so you do not lose the pins. Your coop is now finished!! Did you build it in less than 30 minutes?? If you have a predator problem you can change out the Chicken wire with Hardware cloth and Raccoons and Fox can not chew through this. 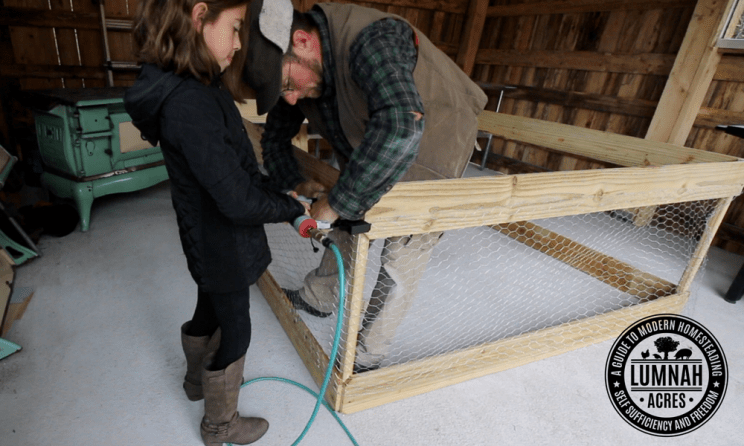 We use chicken wire on all of our Chicken Coops and Chicken Tractors. 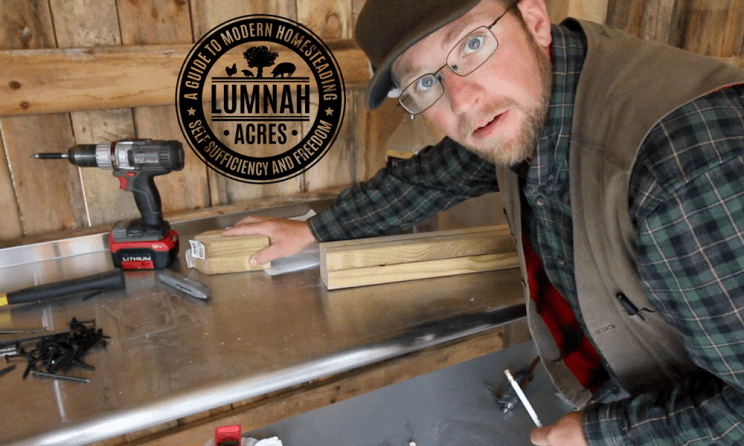 Now that Chicken Coop is Built, What’s Next? Now you need a feeder and a waterer. 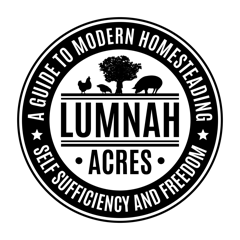 We have had great success with www.coopsnmore.com If you use the Promo code Lumnah at Check out you will receive 10% off your order before shipping. Now that you are set up and ready to go you are just missing the chickens for the chicken coop! There is plenty of online hatcheries. Here are a few of our favorites, Cackle Hatchery, Mt Healthy Hatchery and Murray Mcmurray Hatchery. We have used many of them with great success and we also have gotten our chicks from our local feed store as well as tractor supply. 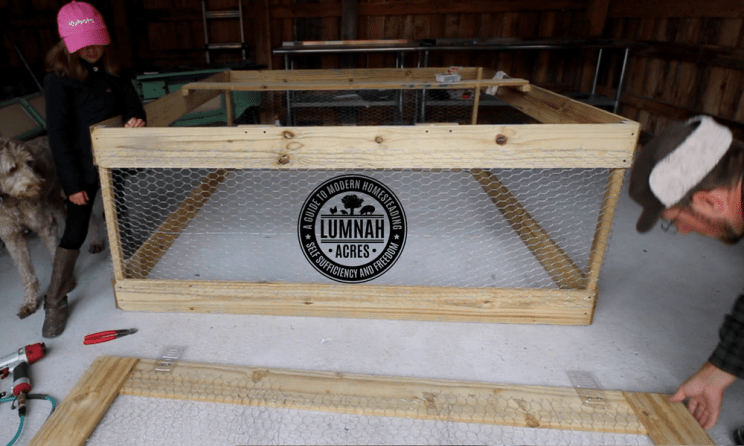 If you are adding the optional accessories to this coop please now follow the optional accessories instructions part 1, Automatic Chicken Waterer, DIY Automatic Chicken Feeder. 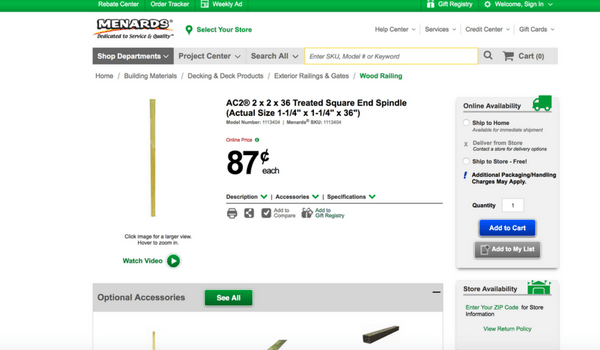 Is a deck spindle the same as a deck baluster? My Lowes only carries composite or aluminum balusters. The cheapest is a 5-pack of white 38″ composite for $22.86 which is kinda pricey. I think I’ll go with the fir 2x2x8 at $1.97. Fence pickets are $2.38. 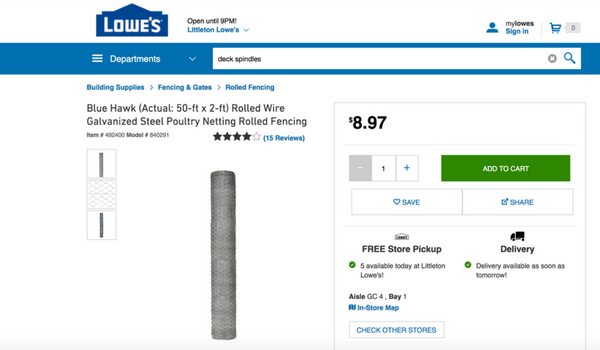 The chicken wire is $8.97 but raccoons will tear right through chicken wire! I need a Menards here!! My only hope is those pickets may drop in price next summer. Or if I get bored this winter…I may just do it! Yes, they spindle and a baluster is the same. It is crazy the different pricing. The 2x2x8 fir sounds like the best one. That is a big jump in price for the pickets. Is that a Pressure treated one? Yes if you have problems with raccoons use hardware cloth. No, it’s not a pressure treated picket. Pressure treated pickets are $3.09 a piece but I don’t think I want treated wood around my animals. The raccoons also dig. They used to dig under the coop walls and grab hens that slept in the corners. I had to make a new winter coop with doors they couldn’t open and a 4×6 sill plate – they haven’t got in since I built a Fort Knox coop. What have you used to to keep critters from digging under the chicken tractor walls? The pressure treated one here are cheaper than the other ones. Too funny. I have the chicken wire coming off the bottom of some of our tractors and laying a foot on the ground. If that makes sense. Way too funny on the prices! Yes, laying wire on the ground a foot out – gotcha! What dont people generally talk about? Most people associate a very hot Las Vegas with all of Nevada. My area is alpine desert – no where near as hot in summer and a whole lot colder in winter! What type of tarp are you using? I don’t see white tarps for sale here. Your critter proof wire…do you lift it up to move the tractor? I would see it catching on anything and everything! Or folding up underneath the tractor! If just the front and forward sides are lifted, would the remainder sides and back glide over the ground or catch hold of ground debris? Trying to figure that aspect into the design. Looking to build this for our meat birds next spring. How many chickens do you keep in this size coop at once? It will be maxed out with 25 full-size chickens. You will have to move it twice daily with that many chickens in there when they are full grown.